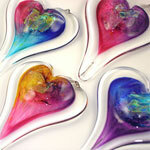 Small hanging glass hearts by Luke Adams. 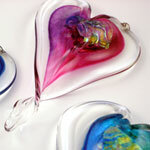 Each heart features three colors and a dichroic glass accent. They measure approximately 2.5" across and are signed by the artist. The top of each heart has a carefully crafted, hanging loop.